In order to unify their empire and link together Gaul, Germania and Italy, the Romans built a dense network of roads through the Alps, over the strategic mountain passes and with multiple structures. Each route, including the Via Domitia, the Little and Great St-Bernard Passes, the Oisans route, facilitated the military and economic expansion of the empire and its administration. This article looks at that road network. By Jean-Pascal Jospin, director of the Musée archéologique Saint-Laurent in Grenoble. The coat of arms of the Duke of Lesdiguières portrays a roaring lion under three roses. The protestant military leader was indeed a lion, or rather a fox, and an outstanding organiser who transformed the Dauphiné and consolidated royal power there. 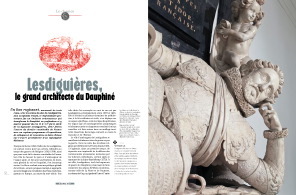 The 1500s and 1600s were the high point in the Lesdiguières dynasty and the last Connétable de France will be celebrated with an extensive programme of exhibitions, symposia and meetings in the Isère department. A glimpse at the multi-faceted works of the tireless builder. By Stéphane Gal, instructor-researcher at the Grenoble Alpes University. Mountain warfare had to be prepared and theorised. That was the task of two great military thinkers under Louis XIV and Louis XV, namely Sébastien le Prestre, also known as Vauban, and a man born in the Alps, the officer and geographer Pierre-Joseph de Bourcet. Two different approaches to war, but an identical analysis of the difficulties imposed by the terrain and a single objective, that of modernising the defence of the Alps. By Nicolas Morestin, former assistant for heritage conservation at the Orange museum, with a degree in history. The Marquis de Saint-Marsan is a little known figure in history books. 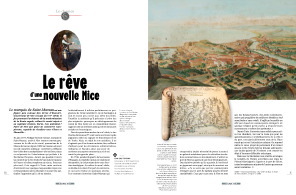 As the governor of Nice in the 1700s, he was the man behind the modernisation of the Royal road between Nice and its capital of the time, Turin. His ambition was to make Nice a trade hub in Europe, capable of competing with Genoa and Marseille. By Jean-Loup Fontana, head curator for heritage. The Prefect Ladoucette was just 30 when he was appointed to the Hautes-Alpes department. At the time, the newly created department was a bare slate. Ladoucette adopted a comprehensive and integrated approach to territorial development that was rare at the time, taking interest not only in trade, but also in schools and hospices. However, the most urgent task was to create road links to the outside. A portrait of a builder of roads. By Jean-Loup Fontana, head curator for heritage. 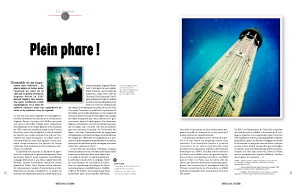 The tower of Grenoble is a long story. The Alpine “lighthouse”, made of reinforced concrete in the middle of Grenoble by the great architect Auguste Perret in 1925, will (finally) be renovated. Another architect, Leslie Cunningham, brought to light the many nuances and details in a flourish of sky and colours. A kaleidoscope of views. 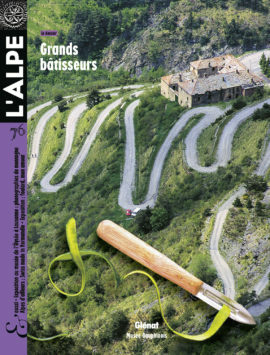 By Jean Guibal, editorial director of L’Alpe, and Leslie Cunningham, architect and photographer. A good idea, the Snow Plan ? In the after-war period, France placed its bets on winter sports in the form of several Snow Plans. The plans resulted in several dozen brand new ski resorts. Now, 50 years after the creation of Courchevel, a new look at a no-holds-barred development initiative and at the Swiss and Austrian approaches. By Emmanuelle George-Marcelpoil, PhD in economics, Hugues François, PhD in territorial planning, and Coralie Achin, PhD in territorial science. The Élysée Museum in Lausanne is one of the most important cultural institutions worldwide devoted (as its name does not indicate) to… photography. This spring, it turned to the Alps and revealed for the first time almost 300 photos of which over three-quarters were drawn from its own collections. Ranging from the 1840s to today, the photos tell the story of how the high mountain regions fell under the sway of the imagination of photographers. Magnificent. 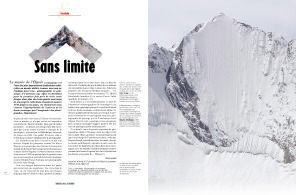 By Daniel Girardin, head curator of the Élysée Museum, and Pascal Kober, editor-in-chief at L’Alpe. Each to his own mountains. Rolling hills, bright green pastures and a long-standing tradition of dairy were enough for advertisers to evoke the idyllic Swiss setting for this part of Normandy, calling it “Swiss Normandy” or “Little Switzerland”. For those who appreciate geographical slight of hand. By Guillaume Lebaudy, ethnologist. The small square of fabric, an emblem of femininity, long the province of peasant and working women, at one point became an indispensable feature of seduction, promoted by all the great fashion houses. The Mountain Museum in Turin decided to collect headscarves portraying mountain summits and their symbols. The exhibition holds up a double mirror in that it reflects the history of the images of both women and mountains. 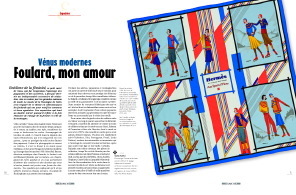 By Silvia Vacirca, instructor of the history of fashion in cinema at La Sapienza University in Rome.